I think I'm getting the hang of this prison-building lark. 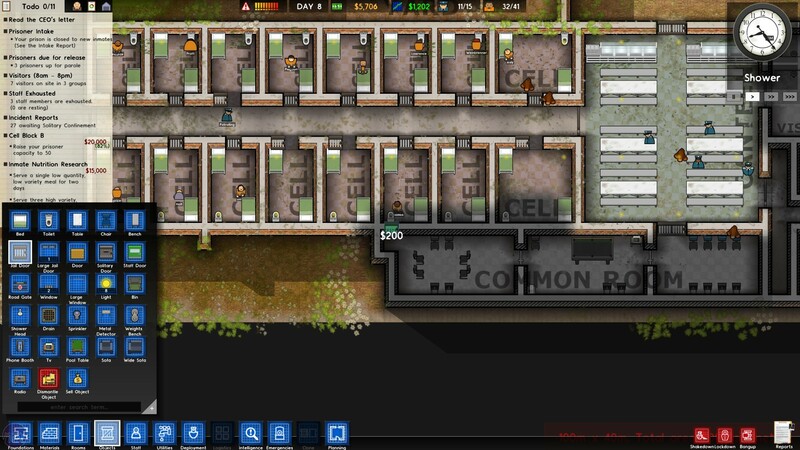 I've constructed two prison blocks without breaking the bank, and my prisoners have access to all basic facilities, toilets, showers, canteens, and a yard for exercise and free-time. There's a common room where they can relax, shoot pool and watch TV, and a visitation area where they can spend quality time with their families. I'm even thinking about starting some reform programs, drug and alcohol rehabilitation, psychotherapy, those sorts of things. All in all, I'm pretty proud of my prison. There's just one teeny, tiny problem. It doesn't have any walls. Walls, it turns out, are quite important when building a prison. I suppose I knew this deep down, but it was surprising how long it took for the importance of walls to become apparent. 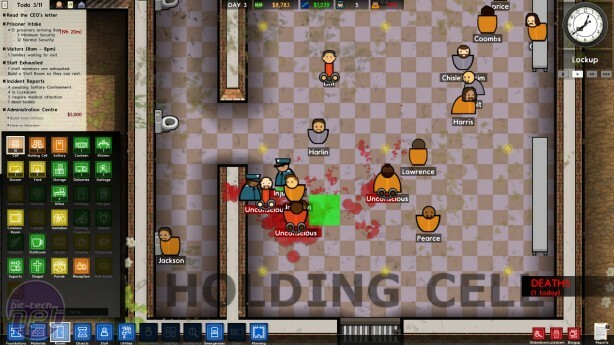 My first influx of prisoners seemed quite happy to be transferred to my holding cell and wait there while I figured out what the hell I was doing. Then I got a little sidetracked by the bureaucratic side of prison building, hiring employees, tending to finances, plotting out guard patrols, and so forth. "It's fine," I told myself as my prison expanded and my walls didn't. "The prisoners seem nice enough. There's only been one murder and a couple of beatings. It's fine." Building things in Prison Architect is a gradual process. But your prisoners don't understand that. They want everything now and are more than happy to show their discontent, which they duly did when I dragged my heels building a visitation area. But as far as I'm concerned they can shout all they like behind closed doors. This proved to be a pretty good policy until the doors weren't closed anymore. That's right, one day all of the doors in my prison just opened. I don't know why this happened, but it turns out doors are very important in a prison too, especially when you don't have any walls. Ten prisoners escaped that day. Another four died in the ensuing ruckus, and multiple prisoners and guards were carried off to the infirmary with serious injuries. 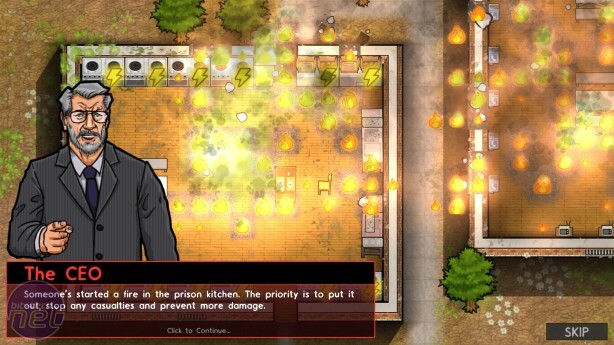 Prison Architect might give you the job of building a prison, but what it's really about is getting that job horribly, horribly wrong and dealing with the consequences, often with the aid of a mop and bucket. It's a unique and delightfully detailed management game. What's more, the stories that result from trying to spin its many plates are equal parts wonderful and horrifying. Playing Prison Architect does take a bit of getting used to, however. This isn't surprising given Introversion has been adding layers to it over four years. Even so, I bounced off my first attempt at prison architecture like a squash ball off a speeding train. There's an awful lot to take in at once, and money is supremely tight, so it's possible to bankrupt yourself before you've built your first prison block. To aid this, Prison Architect offers a five-mission "Campaign", which is really a tutorial wearing a cunning disguise. Even here, the beginning is an odd one, asking you to build an execution chamber in order to carry out a death sentence. 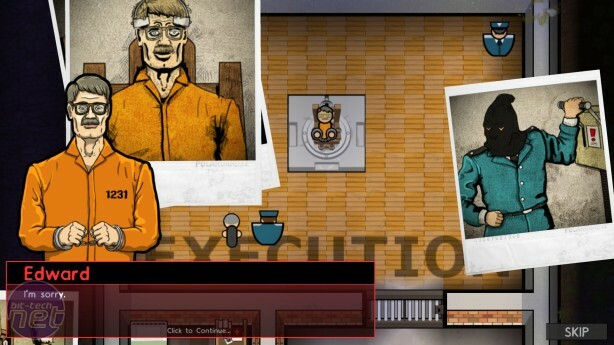 Through this, Prison Architect teaches you the basics of laying foundations and constructing rooms, but the subject matter makes it feel weirdly like you're starting at the end. Nevertheless, it's worth persevering. The campaign allows a certain level of creativity, and the loosely connected stories it tells are surprisingly compelling.